"The Basement": 6 triple power rooms in various stages of upgrades to complete objectives; they are rebuilt and upgraded as needed. These are now completely unmanned, dwellers shown there in the screenshots have been moved to guard residences between the training rooms to keep radroach outbreaks from spreading all over. 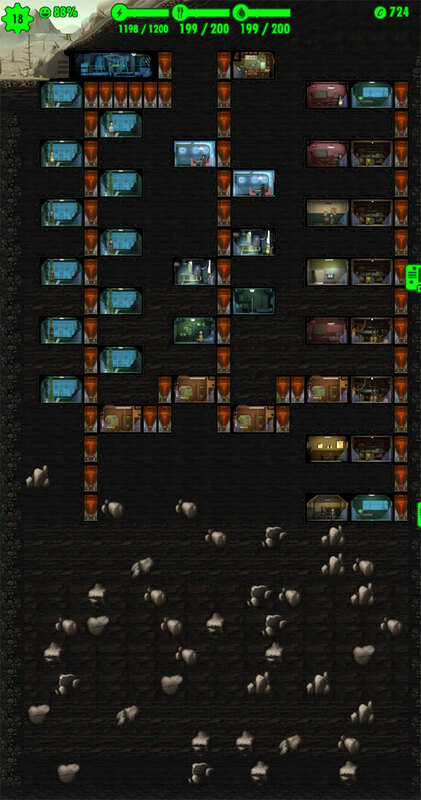 All resource-generating rooms (except for the basement) are fully-staffed. As for SPECIAL stats, the entire first floor and the far-right nuclear reactor on the second floor all have 10 strength, 10 endurance, and 10 luck (some stats are filled in by gear, some gear pushes them over those numbers); they also have the highest-damaging weapons in the vault and are at or near the max level of 50. The guards in the vault door room and the first-floor storage room are level 50. Until I added the guards in the storage room, deathclaws tended to make it to the second-floor right-hand nuclear reactor. The SPECIAL stats for every other resource-generating room are whatever the room requires, plus luck, at 10 (including gear, some of which pushes dwellers past 10). There are two exceptions, one of which is the triple storage rooms which have level 50 guards that were pulled from nuclear reactors and replaced by other dwellers (therefore those guards have 10 strength and 10 luck, since staffing storage rooms doesn't actually seem to do anything). The other exception is the radio rooms, where the dwellers have 10+ charisma with gear but I ignored luck in case it brings newbie survivors in faster and that is the last thing I need. I wish it were possible to turn that option off for radio rooms... this vault surely has a reputation for being a bottomless deathtrap at this point. The radios keep happiness high, and while doubling the original two triples I had definitely made a notable difference to get happiness closer to 100%, it also attracts more newbie survivors who are useless to me. I used to kill them off in the "incident room" single nuclear reactor on the first floor, but now I use one of the single science labs because the entire first floor is set up with guards and I got tired of moving them. For quite a while, many floors were devoted to training rooms. I had roughly half my population in training while half worked to keep resources flowing, along with leveling up. All the dwellers except for the dream team are now done training. My "dream team" is eight favorite characters (mine and a friend's original characters plus Richard B. Riddick, as best the game could duplicate them) who are completely maxing out their stats at 10, not counting gear. I intend to use them for creating a few more dweller children (update: bah, two kids in a row had the same crappy stats as any other level 1 newbie, sad... so ends the era of babymaking), seeing if they have notably better luck in the wasteland, and probably taking over guard/working positions on the first floor. The only other dweller with maxed stats (including gear) is Hannibal Lecter, and he spends his time in the wasteland for long stints. I won't bother with a room breakdown since the vault is still in progress, plus the screenshot montage is fairly crappily-done. But the general idea is proving interesting, and I do wonder if I'll have enough room to get population to the magic deathclaw number of 60... kind of hoping not, although by then I should have enough single-person medlabs churning out stimpacks to keep the initial set of guards alive. I also have no idea how deep the deathclaws might go, nor what path they will take at the crossroads between power rooms and residences. Anyways, the general idea is elsewhere on the internet, that an isolation vault has rooms with only one person, and they never meet. I have further fine-tuned the concept into more rules, like how no set of adjoining rooms will have more than one dweller for the entire set (the ones on the far-right side), and how most rooms are stacked kitty-corner to each other (stops incidents from spreading to other rooms). Very low-level dwellers can escape to a safe, empty room to avoid incidents, but decent-level dwellers must stay in their room and see the incident to its end. Maybe someday I'll fill in all the dirt borders around rooms with elevators, but if so, that's an expense I am not looking forward to. I want to see how the dwellers handle molerats before I decide on that, and I like the clean look of the current setup. There will be one more diner and one more water room on the upper-middle tier when population requires it, and most likely more once I dig that tier lower. If I get far enough in population, those rooms will become gardens and water purification plants, possibly even Nuka Cola plants but I doubt my population will get high enough. There is a version of Hannibal Lecter in this vault too, and he either controls the radio room to bring in new dwellers, or goes out into the wasteland to collect gear, to keep supply ahead of demand. 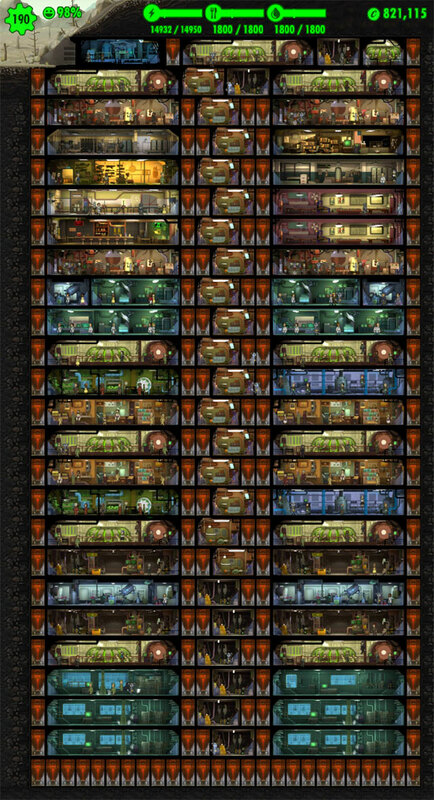 Something I noticed by taking apart the old vault (which I realized was fast becoming a boring version of the Megavault), is that at 13 dwellers, I had no raider attacks nor molerats even though I had rooms unlocked in build mode from initially having 50 dwellers. It seems population limits directly affect what spawns, and it's not a "no turning back" situation when you go past the magic number for specific incidents. (I believe 40 is molerats from what I've read elsewhere, and 60 for deathclaws; not sure about raiders but I think they finally showed up after I had 15 dwellers). I feel like I'm forgetting something... par for the course. So yeah, that's my foray into Fallout Shelter. There pretty much is no endgame aside from upgrading dweller gear via wasteland runs and waiting for the last leveling dweller to hit 50. It's definitely a game where the journey is the point. Oh, and you know those toys toddlers have, the noisy ones that "magically" break, or have the batteries removed in the dead of night and, oh, "they don't make batteries like that anymore"? This game is totally that, for adults.